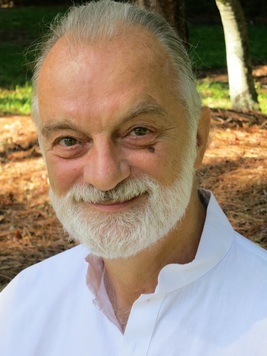 with Swami Ram Giri, Ph.D.
Ramgiri has one mission: to share with individuals like you the wisdom and limitless power that lies at the core of our being, in the spiritual Heart. If you are searching for peace of mind, emotional harmony and unconditional love, HeartSourcing™, may be for you. It is practical mentoring in the most effective ways to awaken your blissful awareness, the true quality of your soul. In this presentation you will get clear guidance to optimize your present efforts to improve your life, to end mental stress, emotional tensions, past trauma and personal conflicts. This is practical information that can serve you for the rest of your life. We will end with a mantra meditation to nurture yourself from your spiritual Heart. In our conditioned state of mind, we believe we are the body and the ego-based personality. We identify with its layers: thoughts, emotions, behavior and physical manifestations and believe that’s all there is to us. It is a view our culture reinforces constantly. But body and personality is not what we are. We are the immortal and blissful consciousness that inhabits this vehicle (the body) for a while, a consciousness embedded in a limitless, timeless awareness in which all form, the entire creation, arises. This is the Self, the presence of the Absolute, beyond all form as well as immanent in every part of creation at the same time. We can access it in the “Cave of the Heart,” a portal, leading us beyond the limits of time and space to our enlightened being. By seeking to realize our identity as the Self, we come to end our confusion and suffering and allow the restless mind to merge into the heart. That is the wisdom and bliss of enlightenment. HeartSourcing Yoga opens our Heart, mind and emotions to bring our whole being into harmony. Rather than search in vain for fulfillment from external sources, HeartSourcing takes us home into our own heart. It is a wonderful way to nurture yourself from your own inner core, so your love can shine into the world. Join Ramgiri for a journey into your own Heart… you will find that it is a wide as the world, and in that all suffering, fear and doubt can be melted. "The change you have prompted in my own life is one of the biggest I’ve ever experienced. There are hundreds of others who feel the same. I could never thank you enough… Personally, I’m deeply honored and grateful to call you friend."